On this Election Day, voters across California are heading to the polls to decide 11 statewide propositions, the governor's and U.S. Senate races, numerous highly contested House races and a slew of local races and measures. Voter registration in California was at an all-time high leading into today's midterm elections. Here are 12 things to know as you head to the polls. So far, Bay Area counties are reporting significantly high voter registration and turnout numbers. "We hit a new milestone on Friday," said Jim Irizarry, San Mateo County's chief elections officer. "For the first time in San Mateo County's history, we hit 400,000 registered voters ... so there's a lot of voter engagement." There are 503,000 eligible voters in the county. For comparison, Irizarry says the Obama ('12) and Trump ('16) elections had 385-390,000 registered voters. "Those were extremely large presidential elections. So for a midterm election, this is impressive. This is very high." A tip sent to ProPublica's Electionland project, which is monitoring voting access across the nation in real-time, reported that voting machines were down in San Mateo City Hall at around 8:30 a.m. In response, Irizarry acknowledged a 10-minute delay at the City Hall location when they needed to restart the internet connection. During that time, he said, people could still vote via paper ballot. But they could not register or confirm their registration during that time. In Contra Costa County, over 100 people voted at one polling station before 8:00 a.m. Tuesday. "For a midterm election, that's pretty unusual. That's an indicator that the turnout is going to be pretty consistent and busy all day long," said Scott Konopasek, assistant county registrar. "We're looking at an overall turnout probably approaching 70 percent, which would be kind of a record for a midterm election ... We're seeing patterns reminiscent of November 2016." In Antioch, younger voters were energized outside of a polling place Tuesday morning. “We need to get young people in office," said Will Acuavera, a 30-year-old first-time voter. "People like Dianne Feinstein. She’s done great things for California, but her views don't match mine. So I want to get in to vote her out and get people in who are going to be more likely to battle Trump. I used to be very anti-voting until Donald Trump got into office, and seeing how racist things have gotten nationwide, I just couldn’t complain and not vote." “I came out to vote today just because it’s our civic duty and we should vote," said Andrew Murphy, 29, of Antioch. "I feel like every young person, old person, everyone should go out and vote ... We all have the power to change what is going on in the world. We just have to go out and vote and make that change." "We're well ahead of the June 2018 election, which was our first election as a Voter's Choice Act county," said John Tuteur, registrar of voters. "We're hoping to break into the 60 percent range for total voter turnout for this election." For comparison, in November 2014, the county's turnout was 55 percent. Some voters in Los Angeles County are waiting up to two hours to cast their ballots. A spokesman with the Los Angeles County Registrar says the line at its headquarters in Norwalk is wrapping around the building. Registrar spokesman Mike Sanchez couldn't immediately confirm online posts by a Los Angeles Times reporter that some people were giving up and getting out of line, while others were being handed tickets so they could use the bathroom or get food without losing their place. The site is the only one in the vast county that allows voters to register and cast a ballot on Election Day, a fact that some complained about on social media. Sanchez says he understands the frustration, and that same-day registration and voting is being expanded throughout the county and will be ready in March 2020. Across the state — at least, judging by their Google search activity over the last week — voters have immigration and health care on their minds as they head to the polls. 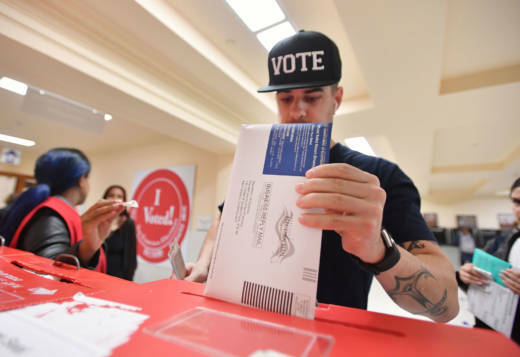 KQED reporter John Sepulvado has been monitoring polling locations in Southern California, where some locations are seeing much longer lines than others. Nationwide, early voting records were shattered with 38 million people voting early, according to the U.S. Elections Project at the University of Florida, which tracks turnout. If early voting makes up a third of all the vote, that would amount to a turnout of 114 million people, or 48.5 percent. If those numbers hold, it would mark the highest midterm turnout rate since 1914. KQED's Monica Samayoa, Marissa Shieh and Angela Corral contributed to this report. This post includes reporting from NPR and The Associated Press.